Because I’m cool, I’m bringing this meme over from Facebook to my blog. It makes for an easy entry and I must admit I ADORE reading other people’s 25 facts. *hintwinkhint* So, yeah, enjoy. 1) Due to writing and online courses, I’m on my computer 90% of the day. Because of this, I tend to reply to emails/comments/messages within minutes of someone sending it. I often feel like a creeper in response, so I try to hold off on replying for at least an hour. 2) I tend to forget that I’m only 17. 3) I don’t know why I moved to Berkeley. It was a rash, random decision that I don’t regret. 4) If I don’t write, I fall apart. 6) If I were to put myself in a religion, it would be Buddhism. Or maybe Pantheism. But I’m still reading and believing and questioning. 7) On that note, I believe in intuition, spirits, energy. Coincidence is rare – everything happens for a reason. I think there is a lot more to this world and life than we can even begin to comprehend. 8 ) Climate change and natural disasters scare the living hell out of me. 9) Organic peanut butter & jelly on sprouted bread with chai tea is love. 10) Though my health is unrecognizable to how it once was, I still suffer from fatigue, chronic pain, and can’t push myself too hard. Even if I spend my entire day in bed, I’m exhausted. 11) Don’t ask me what my favorite book is. You’ll receive a blank stare and an “Uhhhh.” There are too many brilliant novels to narrow it down to one. 12) If you give me your address, I can guarantee that I’ll hand write you a letter. I adore sending snail mail, almost as much as I love receiving it. If you write me or send me a package the old-fashioned way, you can rest assured it made my day. 13) I’m terribly cheesy and absolutely sensitive. 14) I’ve been writing in my private (Live)Journal for 4 years now, every day, up to 10 times a day. No joke. I’m not exaggerating when I say I write a lot. 15) I get sickly jealous when anyone mentions Colorado. My heart literally skips a beat when I see a Colorado license plate or hear the state’s name. I will always feel this way. That place is the home of all homes to me. 16) I finished my second young adult novel two weeks ago and I’m itching to start my third. I’m holding off for a few months for editing and to give my sanity a break. 17) I make my bed every single freaking day of my life. I can’t NOT make my bed. My brain would shatter and explode into a great and terrible firework show. 18) I need nature in my life. I’ve learned that the hard way by moving into a studio with a brick wall as a view and downtown Berkeley as my backyard. I’m contemplating an escape to the Redwoods. Anyone wanna go camping? 19) I’m antisocial and a major homebody. It takes all my strength to leave my house (or apartment), whether it’s for class, work, or the movies. I love being with people, but it’s undeniably difficult to get out of my comfort zone. I think it’s from spending some much time homesick growing up. In result, I’m totally content with a day of cuddling in bed with a good book, Word open, and tea. 20) I’m learning to let go of the past and forget about the future. Writing Falling Into Yesterday helped me a lot with that. 21) Do not send anyone to Rebecca’s House Eating Disorder Treatment Center. 22) I miss working at a comic book store. 23) I have one tattoo (two more coming soon) and 9 piercings. I used to have 11 piercings, but my body is sensitive and easily revolts against metal. Despite that, I continue to get pierced. 24) I have my Father’s skin, meaning I could tan like crazy if I liked. Instead, I slather on SPF 80 and hide from the sun. Direct sunlight literally feels like fire to me. I know it’s all in my mind, but it BURNS! 25) 98.9% of what comes of my mouth (or writing) is sarcastic. Take it however you want, but most likely, I wasn’t being absolutely serious. And I tag you. You, YES, you! So, er, go do it… But only if you want! I would kill for an escape to the Redwood Forest. I’ve been breathing, thinking, writing, and learning in the quaint but bustling city of Berkeley, CA for almost a month now. A MONTH! How did that happen? I have no idea. It just did. A few days passed and several days fell and then suddenly it’s January 29th and February is just around the corner. I’ve put off writing about Berkeley simply because I didn’t know where to begin. The idea of expressing my thoughts and emotions about my new home sounded exhausting. And in all honesty, I’ve been writing about it on my livejournal at least 30 times each day – as Hannah knows. Berkeley is beautiful. It’s weird, unique, filled with pot smokers, and smiling bracelet sellers. I love it here. A dear friend from Colorado visited me last week and he shook his head frequently. No, I’m not. This is just a city. A city with open-minded souls and street musicians that call out to you with pretty names. Berkeley is so different from Orange County, so strange compared to my native home. And I fit right in, I think. I’m not sure how long I’ll be here for – until the end of this semester? Until the end of college career? I don’t know, but I’m thoroughly enjoying each day that I’m given. I refuse to take my time here for granted, because God, does time here swing by fast. In other news, I finished the first draft of Falling Into Yesterday. It’s hard to accept this. FIY has become a very personal and dear thing to me. It brought me out of some of my roughest times the past six months and for that I’m grateful. I’m excited to eventually share the story with the world, for it brings up the question I’ve asked a lot in my own life… But for now, only a select view may see it, including Lauren and Hannah due to their amazing-ness. Anyhow, I’m going to go back to listening to Trevor Hall and contemplating what to start next in my life of writing. The sequel to FIY? Nah, too soon. The novel remake of the 5-page story I wrote when I was 10? Maybe. The Colorado story? Possibly. I spent the weekend at the Southern CA Writer’s Conference in San Diego. I’m burnt and inspired, excited and hopeful. I met with a few agents who seemed enthralled by my work and I got tearful, amazing feedback from my editor. I’m content. I needed more hope and I received it this weekend. I’m “home” right now, in Orange County. I won’t return to Berkeley until Tuesday, which is really nice. I needed a break from the city life. It’s nice to just relax in a warm, large house with a stocked kitchen and my smiling family. The greatest plus? 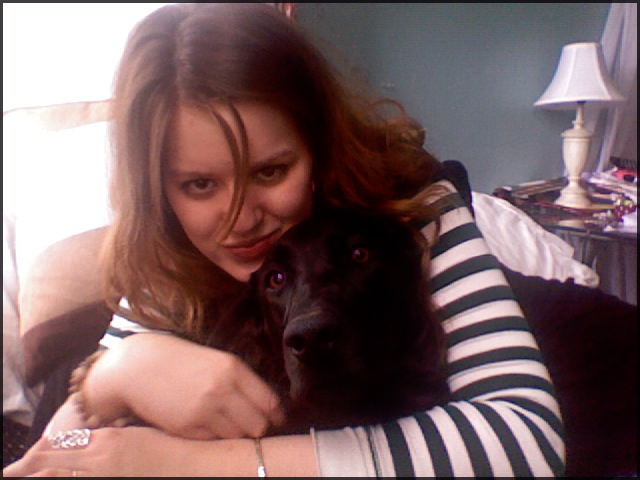 Being with my dog, Bellatrix. Words can explain how much I love her. 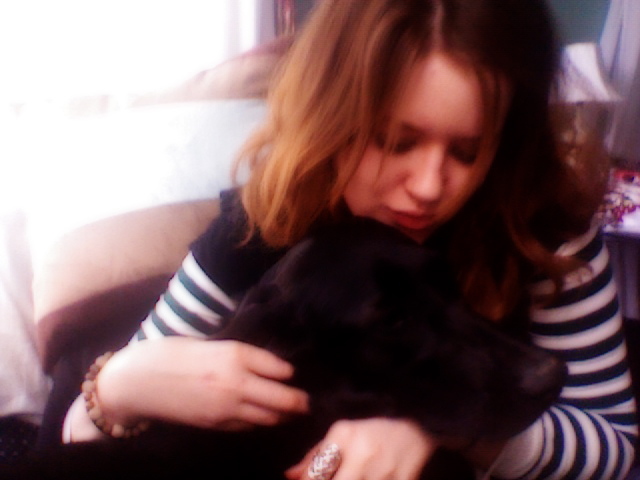 She whimpered when we reunited and I sobbed. I don’t know how I’m going to leave her again on Tuesday. It’s going to be so hard, but I’m beyond grateful to be with her now. I have a memory of steel. I can look at a picture and remember the exact circumstances surrounding the moment the photo was shot–what I was feeling, what I ate last, what boy I was crushing on, what day of the week it was, and so on. I’m not proud of my attachment to time, because that’s just what it is – an attachment. And in my search for inner peace and freedom, I’m trying to free myself of the addiction. I’m trying to learn to stay in the moment I’m in, and not wander back and forth in life. This past semester of college has fallen from my grasp. It feels like last week I was walking through the crowded parking lot in my combat boots, palms sweaty from the August heat. Saddleback College, I was not excited to matriculate into you. I didn’t know where I was going then, what I was waiting for. I had no idea that two close, close people would drift away and new ones would enter. I didn’t know that I wouldn’t connect with a single person in my math class and that I’d drop two of my other courses. I didn’t know I’d ultimately kind of fail at the whole Saddleback deal. The rumors are true: the community college is not that much different than Tesoro High School. Only difference is the cigarette smoke. Anyway, I certainly didn’t know I’d choose to transfer and move to Berkeley – a foreign northern city where I know only a few singular souls. I had no idea how quickly the few months would pass, that weeks would float in blinks of my eyes. But I suppose that’s the fun of life. The unknown. I suppose it is for the better that I didn’t know what was to come. I’m sorry. I do this thing where I’m over dramatic and cheesy and trite and can we blame it on me being a Leo and move on and accept it? Thanks. A month from today I’ll be moving from the town I’ve lived my entire life. And in this moment, I have no idea what will occur once I’m there. And, you know, I think I like that I don’t know what is to come. I enjoy the elation of seeing what occurs from minute to minute.